Daisy has been grounded for the first time and it's all her own fault. But what has she done? Well it involves a strawbery dib dab, germs, a pavement, and many many trips to the loo. 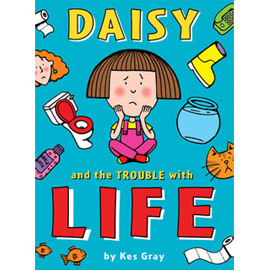 The Trouble With Life is the first of the Daisy young fiction series. It's a book with lots of pictures and lots of words and it includes a lesson that all children would do well to learn. It also has possibly the shortest opening chapters in literary history!